Robbins was born Jerome Wilson Rabinowitz in the Jewish Maternity Hospital in the heart of Manhattan’s Lower East Side – a neighborhood populated by many immigrants. In the early 1920s, the Rabinowitz family moved to Weehawken, New Jersey. His father and uncle opened the Comfort Corset Company. The family had many show business connections, including vaudeville performers and theater owners. 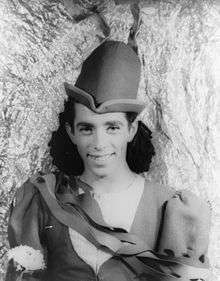 In 1937 Robbins made the first of many appearances as a dancer at Camp Tamiment, a resort in the Poconos known for its weekly Broadway-style revues; he also began dancing in the choruses of such Broadway shows as Great Lady, and Keep Off the Grass, both choreographed by George Balanchine. Robbins had also begun creating dances for Tamiment’s Revues, some comic (featuring the talents of Imogene Coca and Carol Channing) and some dramatic, topical, and controversial. One such dance, later also performed in New York City at the 92nd Street Y, was “Strange Fruit,” set to the song performed indelibly by Billie Holiday. 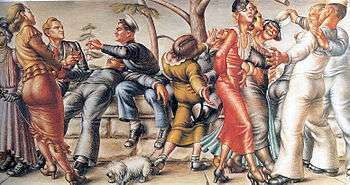 Robbins created and performed in Fancy Free, a ballet about sailors on liberty, at the Metropolitan Opera as part of the Ballet Theatre season in 1944. . One of Fancy Free's inspirations was Paul Cadmus' 1934 painting The Fleet's In! However, Robbins' scenario was more lighthearted than the painting. Robbins said in an interview with The Christian Science Monitor: "After seeing...Fleet's In, which I inwardly rejected though it gave me the idea of doing the ballet, I watched sailors, and girls, too, all over town." Robbins commissioned a score for the ballet from the then-unknown Leonard Bernstein and enlisted Oliver Smith as set designer. With Fancy Free, Robbins created a dance that integrated classic ballet, 1940’s social dancing, and a screwball plotline. While he was forging a career on Broadway, Robbins continued to work in ballet, creating a string of inventive and stylistically diverse works including Interplay, to a score by Morton Gould, and Facsimile, to music by Leonard Bernstein, a ballet that was banned in Boston [CK]. In 1949 Robbins left Ballet Theatre to join George Balanchine and Lincoln Kirstein’s newly formed New York City Ballet as Associate Artistic Director. Soon after that he choreographed “The Guests,” a ballet about intolerance. In 1954, Robbins collaborated with George Abbott on The Pajama Game (1954), which launched the career of Shirley MacLaine, and created, choreographed, and directed the Mary Martin vehicle, Peter Pan (which he re-staged for the small screen in later in 1955, winning an Emmy Award, and again in 1956 and 1960). He also directed and co-choreographed (with Bob Fosse) Bells Are Ringing (1956), starring Judy Holliday. Robbins recreated his stage dances for The King and I for the 1956 film version. In 1957, he conceived, choreographed, and directed West Side Story. Robbins was still highly sought after as a show doctor. He took over the direction of two troubled productions during this period and helped turn them into successes. In 1962, he saved A Funny Thing Happened on the Way to the Forum (1962), a musical farce starring Zero Mostel, Jack Gilford, David Burns, and John Carradine. The production, with book by Burt Shevelove and Larry Gelbart, and songs by Stephen Sondheim, was not working. Robbins staged an entirely new opening number which explained to the audience what was to follow, and the show played successfully from then on. In 1964, he took on a floundering Funny Girl and devised a show that ran 1348 performances. The musical helped turn lead Barbra Streisand into a superstar. The 1980s saw an increased presence on TV as NBC aired Live From Studio 8H: An Evening of Jerome Robbins' Ballets with members of the New York City Ballet, and a retrospective of Robbins's choreography aired on PBS in a 1986 installment of Dance in America. 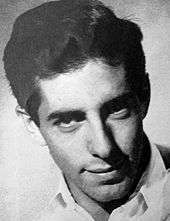 The latter led to his creating the anthology show Jerome Robbins' Broadway in 1989 which recreated the most successful production numbers from his 50-plus year career. Starring Jason Alexander as the narrator, the show included stagings of cut numbers like Irving Berlin's Mr. Monotony and well-known ones like the "Tradition" number from Fiddler on the Roof. He was awarded a fifth Tony Award for it. Robbins was bisexual: he had a relationship with Montgomery Clift and never married. For many years Robbins maintained a close friendship with ballerina Tanaquil LeClercq. As documented in the film "Tanaquil LeClercq: Afternoon of a Faun," they expressed deep mutual affection. ↑ Fick, David (November 12, 2008). "Something to dance about: new Jerome Robbins documentary". Musical Cyberspace. Retrieved 2014-02-25. ↑ 69th Annual Peabody Awards, May 2010. 1 2 Kisselgoff, Anna (July 30, 1998). "Jerome Robbins, 79, Is Dead; Giant of Ballet and Broadway". The New York Times. Retrieved 2014-02-25. ↑ Paul R. Laird and David Schiff. "Bernstein, Leonard." Grove Music Online. Oxford Music Online. Oxford University Press. Web. 14 Aug. 2014. <http://www.oxfordmusiconline.com/subscriber/article/grove/music/A2223796>. ↑ Green, Jesse (March 15, 2009). "When You're a Shark You're a Shark All the Way". New York. Retrieved 2014-02-25. ↑ Lewis, Robert (1996). "The Actors Studio, 1947". Slings and Arrows: Theater in My Life. New York: Applause Books. p. 183. ISBN 1-55783-244-7. Retrieved 2014-02-25. At the end of the summer, on Gadget's return from Hollywood, we settled the roster of actors for our two classes in what we called the Actors Studio - using the word 'studio' as we had when we named our workshop in the Group, the Group Theatre Studio... My group, meeting three times a week, consisted of Marlon Brando, Montgomery Clift, Maureen Stapleton, Eli Wallach, Mildred Dunnock, Jerome Robbins, Herbert Berghof, Tom Ewell, John Forsythe, Anne Jackson, Sidney Lumet, Kevin McCarthy, Karl Malden, E.G. Marshall, Patricia Neal, Beatrice Straight, David Wayne, and - well, I don't want to drop names, so I'll stop there. In all, there were about fifty. ↑ Harris, Jay S. (editor) (1978). TV Guide: The First 25 Years. New York: New American Library. p. 23. ISBN 0-452-25225-3. ↑ Gihring, Tim; Scott, Gregory J. (July 2011). "July 2011 Arts Calendar". Minnesota Monthly. Greenspring Media Group Inc. Retrieved 2014-02-25. ↑ Vaill, Amanda (January 27, 2009). 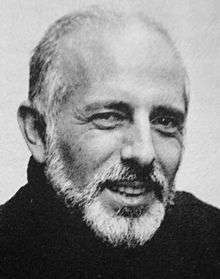 "Jerome Robbins-About the Artist". American Masters. PBS. Retrieved 2014-02-25. 1 2 Vaill, Amanda (May 6, 2008). Somewhere: The Life of Jerome Robbins. New York: Broadway Books. ISBN 978-0767904216. ↑ "About Jerome Robbins: Awards & Honors". JeromeRobbins.org. Retrieved 2014-02-25. ↑ "Jerome Robbins Award". Jerome Robbins Foundation. Retrieved 2014-02-27.